The current struggle between IT security and computer hackers is reaching crisis point. Corporate dependency on computers and the Internet as well as the rapid spread of broadband into more households has resulted in a feeding ground for hackers around the world. Estimated damage costs are now making their way into the billions. The need for some good advice is long overdue. 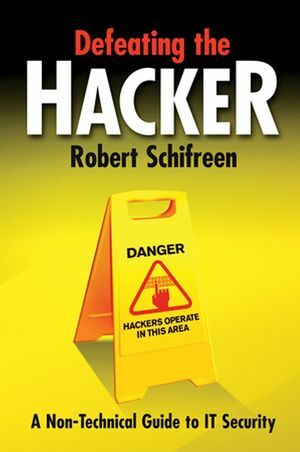 Robert Schifreen, a self-confessed ex-hacker, made history in 1985 when he became the first person in the world to face a jury trial in connection with computer hacking. His subsequent acquittal in the High Court led to a change in UK Law and the introduction of the Computer Misuse Act 1990. His 20 years experience in IT security now lends itself to global radio and TV broadcasts, as well as appearances at conferences and lectures around the world. Keeping your company’s computers free from hackers, viruses, spammers, phishing attacks, social engineers and all the other things that can result in loss of data is a difficult job. Defeating the Hacker is a book about how to protect your computer systems becoming another victim of the hacker. It’s an instant primer into all the things that can go wrong, with advice on how to stop it happening or, if it’s too late, how to fix the damage. Defeating the Hacker allows the reader to learn how to protect their computer systems with advice from someone who knows how to break into them. Robert Schifreen writes and speaks on IT security at seminars and conferences around the world, and has appeared on radio and TV as an expert spokesman around 100 times in the past 6 years. Chapter 2: A Hacker is Made. Chapter 3: Preparation and Planning. Chapter 4: International Laws and Standards. Chapter 5: Passwords and Beyond. Chapter 7: Security Awareness Training. Chapter 9: Windows Workstation Security. Chapter 10: Basic Server Security. Chapter 12: Protecting Your Web Site. Chapter 15: Security Through Obscurity. Chapter 18: The Curse of Spam. Chapter 20: Spyware, Adware and Rogue Diallers. Chapter 22: File Sharing and ‘P2P’. Chapter 23: Backups and Archives. Chapter 24: Preventing Internet Misuse. Chapter 28: Employees’ Own Computers. Chapter 29: How Hackers Use Search Engines. Chapter 30: Denial of Service Attacks. Chapter 31: Provisioning and Identity Management. Chapter 33: Out of the Office. Chapter 36: Intrusion Detection Systems. Chapter 38: Securing your Premises. Chapter 40: Planning for the Worst. Chapter 42: Let’s Be Careful Out There.